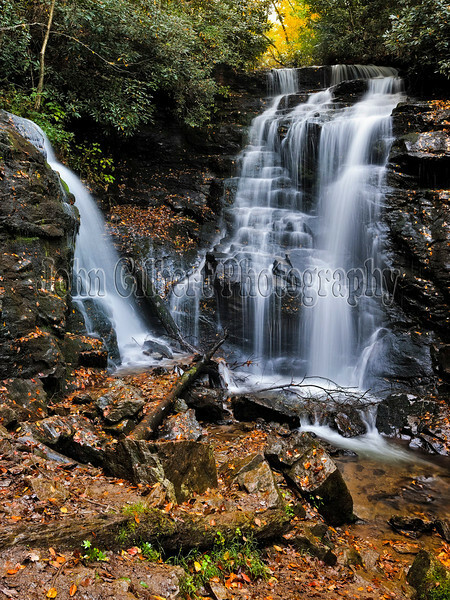 Soco Falls is a 35 foot waterfall located on the Cherokee Indian Reservation in Jackson County, North Carolina. There are two falls here forming a single creek at their base. The right side fall can be photographed from the observation deck, which is located about 100 yards from the parking lot. To get to the base of the falls is trickier and requires some climbing. Someone place a rope from the observation deck to the base when I was their on 10/13/2012. However; I had taken a rope with me. On a scale of 1 to 10 to rate its beauty I would rate it an 8. Taken at 6:45AM, using a Nikon D600 and 24-70mm telephoto lens set at 45mm. Aperture at f/4, Shutter 1.0 sec. and ISO 200. Used a polarizer and tripod.